There’s nothing more nostalgic for me than a good Sunday roast. Beef or pork sirloin, I’m not picky, I love either one. I’ve made this sirloin pork roast for dinner numerous times and every single time it’s perfectly juicy and full of flavor. It’s probably one of the only “grown up” meals I loved as a child and I still remember sitting impatiently at the table as the aroma made me nuts. And, the tradition has continued as my kids love this meal too. Pork is a succulent meat, one that many tend to overcook and dry out for fear of not cooking it long enough. This makes it inedible without mounds of gravy. 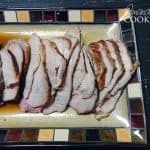 Not this pork loin roast recipe, this one is the best! I originally found this recipe on the blog, Seriously Good by Kevin Weeks. The blog is gone now and sadly Kevin passed away. While I didn’t know Kevin I did have the opportunity to enjoy this delicious recipe of his. I am sure he is sorely missed. I’m so glad I saved this recipe. I would have been seriously bummed out to go there and find it had disappeared. Mine isn’t exactly like his, there were a few small tweaks, but it’s positively the best sirloin pork roast I’ve ever had. This is my go-to sirloin pork roast recipe now. I love it, it’s perfect. So thank you, Kevin Weeks, for the great recipe! 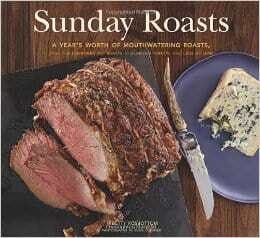 Sirloin Roast Beef – This particular recipe comes from the cookbook “Sunday Roasts” that you see pictured here. It absolutely reminds me of the roast from my childhood. Tender and juicy and perfect for when you have company. To Die For Pot Roast – This is also a go-to recipe for me. It’s a crockpot recipe using a chuck roast and it’s always tender and delicious, a family favorite. Slow Cooker Pork Sirloin Tip Roast – I haven’t tried this recipe from Kalyn’s Kitchen yet, but it looks amazing. Definitely on the short list to try. One of my favorite cookbooks for roasts is Sunday Roasts: A Year’s Worth of Mouthwatering Roasts, from Old-Fashioned Pot Roasts to Glorious Turkeys, and Legs of Lamb by Betty Rosbottom. 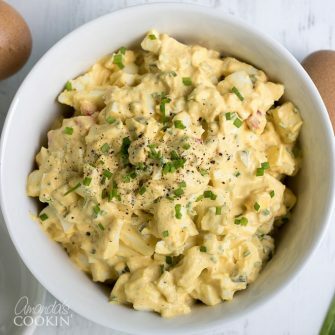 I have tried several of the recipes and they have all been wonderful! What is your favorite roast recipe? I’ve made this sirloin pork roast for dinner numerous times and every single time it’s perfectly juicy and full of flavor. Rub pork with one teaspoon of the garlic. Combine the rosemary and thyme in a small bowl and crumble together with your fingers. Sprinkle herb mixture onto all sides of the pork. Season with salt and fresh ground black pepper. Pat meat to gently rub everything in. Heat oil in a 9"-10" cast iron (or oven-proof) skillet over medium-high heat. Brown roast on all sides then remove to a plate and set aside. Add onions, carrot, and celery to skillet and saute, stirring occasionally, until vegetables begin to brown. Add remaining garlic and cook a minute longer. Deglaze skillet with beef broth. Place roast on top of vegetable/broth mixture and place skillet in center of oven. Cook until an instant read thermometer's internal temperature reaches 145 F (about 2 hours). Remove roast from oven and tent with foil. Allow to rest for 10 minutes before slicing and serving with pan juices. I noticed that weight of the roast doesn’t seem to be considered in either comments or replies regarding longer cooking times? That is a factor…..correct? I wonder what would happen if I rise the cooking temperature to 300F ?. Would that affect the moisture/tenderness of the sirloin roast?. Thanks for your comments. I believe it might because it would cook faster. If you try it, would love to hear what your results were. The pork sirloin roast lacks any marbling so cooking it low and slow prevents the meat from being dry and tough. I layer some thick cut pepper bacon over the sirloin roast which adds some flavor and helps to keep the meat moist and tender. One key thing for everyone that is posting that this took longer than 2 to 3 hrs. ( Depending on roast) you can’t open the oven 40 times to see how it is doing. Mine came out great, thanks for sharing recipe!!! That is correct for sure. I use a meat thermometer that has an oven safe connected cord so that the probe stays in the meat and the temperature display is outside of the oven. That way I never have to open the door. Going to try this recipe tomorrow. Will let you know how it turns out. The title says Pork Sirloin Roast yet the recipe says pork loin roast. They are different cuts of pork. Is the recipe just a misprint? Hi Mike. I’ve received a lot of questions about this. 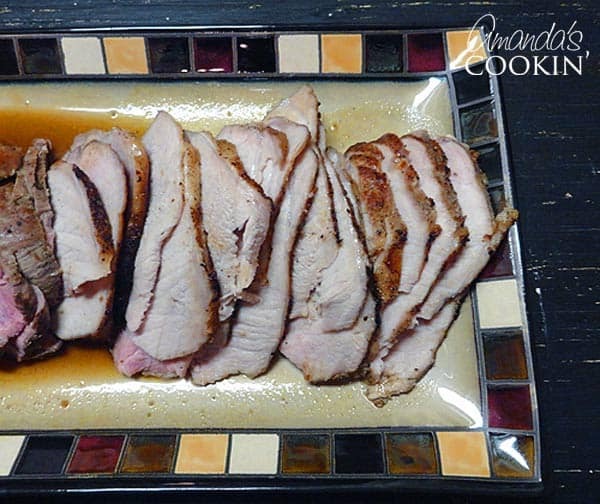 This recipe works with both a pork loin and a pork sirloin tip roast. In fact, to make sure I tested both of these this week and will updating the post with photos and times. The recipe sounds great. I want to try it tomorrow. One question: do you cover the skillet once it’s in the oven or leave it open? I wanted to confirm that the roasting temp is 225? That seems really low for only cooking it for two hours! Sorry to hear that Ed! I just made this recipe at 225F with both a pork loin and a pork sirloin tip roast this past week to test it. One was done at 2.5 hours the other was 3. We. are trying this for the first time and started it at 6 pm it is 8 45 and still the roast is not done, inside temp is 130 and every where we put the quick read in, blood runs out, we are going to stickmit out to see how it turns out inbtgevend but for sure we should had started this event about 3 pm! Sorry about that Robert. I am adjusting the recipe to read 2-3 hours. I made both a pork loin and a pork siroin tip roast this past week to re-test. One was done at 2.5 hours and the other at 3 hours. I’ll be updating the post with this info. Are you using boneless or bone-in? Bone-in roast will take considerably longer and the size and shape of the roast will make a difference in cooking time. Thank you for sharing Amanda…i absolutely loved it and so did all i shared with. 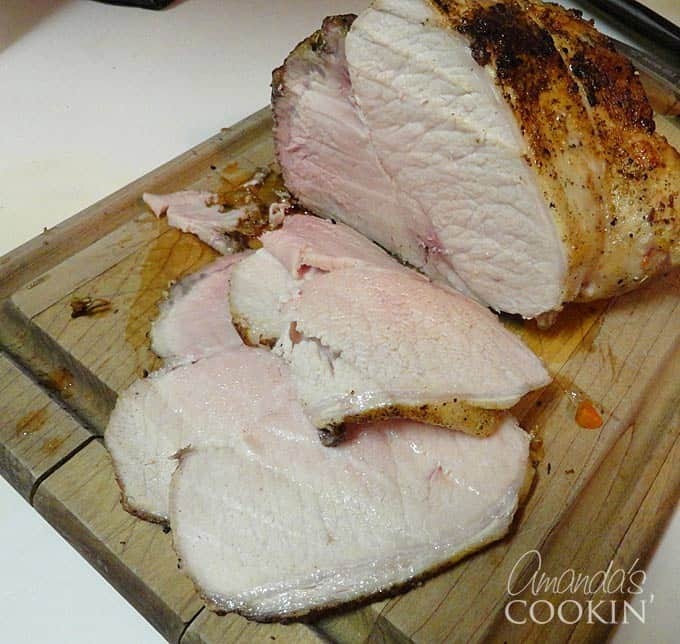 Oh wow… I found this recipe in a pinch one day and I’ll never make another pork roast again unless it’s THIS WAY! Simple and delicious, follow everything to the letter and you can turn a discount cut of meat into a flavorful and tender delight! And I’m not even the cook of the house – the wife and kids we’re quite surprised! That’s awesome Erik, so glad you loved it! I must ask is this a boneless pork loin roast or a sirloin roast? There is a world of difference. A sirloin roast is difficult and does not enjoy the same quality of flavor as a loin roast. I have successfully made both a pork loin and a pork sirloin tip roast (both boneless) using this recipe.